Photo: UN Women/Ryan Brown. Creative Commons BY-NC-ND. For two weeks, thousands of delegates, dignitaries, ambassadors, experts, and activists flooded the city, with more than 650 events, talks, briefings, meetings, presentations and panels all striving for the same goal — “50:50 by 2030,” said Secretary-General Ban Ki-moon of the CSW’s goal for gender equality within 15 years, at the official opening of the commission. Soon-Young Yoon, UN Representative of the International Alliance of Women and Chair of the NGO Committee on the Status of Women, estimated more than 11,000 people took part in CSW 59. 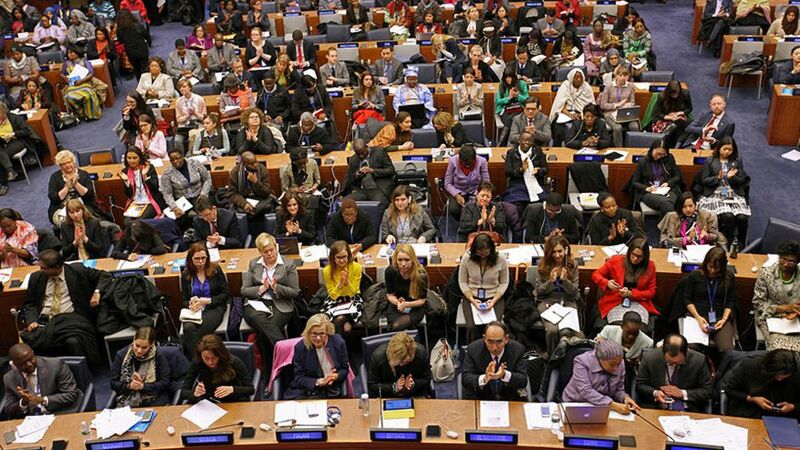 “This was the largest feminist movement at the UN in New York, ever,” she told IPS. Yoon attributed the huge attendance to well-documented attempts to scale back women’s rights worldwide in the last year, including fundamentalist activities in the Middle East and Africa, the kidnapping of 270 Nigerian schoolgirls by Boko Haram, and a growing culture of hostility and harassment of women online. “Against all this, the women’s movement has stepped up. The CSW is a pilgrimage for the international women’s movement,” she said. The 59th session of the CSW was about reaffirming the world’s commitment to, and marking the anniversaries of, the 1995 Beijing Platform for Action and the 2000 Security Council Resolution 1325. Rather than lay out any new bold agenda or fighting for political reforms, it was important to take stock of progress and assess what further action was necessary, said Christine Brautigam, Director of the Intergovernmental Support Division of UN Women. “We were tasked with a comprehensive review of the Beijing platform, of how implementation stands. We’ve come up with good indications of how to move forward,” Brautigam told IPS on the final day of the meeting. She said the Commission had “benefited tremendously” from an “unprecedented” amount of reporting by member states, with 167 countries preparing reports on how gender equality reforms had been implemented. Brautigam said through the immense preparatory work, member states had agreed CSW 59 would produce a “short, succinct political declaration” reaffirming the commitment to fulfilling the vision of the Beijing platform and achieving gender equality by 2030. “I’ve always seen CSW as one of the most, if not the most, dynamic meetings on the UN calendar,” said Liesl Gerntholtz, Women’s Rights Division at Human Rights Watch. There was not an expectation for lengthy negotiations, as we usually have, it was to pledge further action to accelerate gender equality, and ensure full implementation of the platform. The key outcome is that political outcome adopted on the first day,” she said. The declaration features six points for action, calling for renewed focus on and faster progress toward the ideals set out in the Beijing platform. Member states called for strengthened laws and policies, greater support for institutional mechanisms striving for gender equality, transformation of discriminatory norms and gender stereotypes, greater investment to close resource gaps, strengthened accountability for the implementation of commitments; and enhanced capacity for data collection, monitoring and evaluation. “This is a formidable basis for everyone, from governments to the UN system to civil society, to take action,” Brautigam said. While reaffirming past commitments and analysing progress was the official aim of CSW, it was far from the only function of the fortnight of feminism. Liesl Gerntholtz, Executive Director of the Women’s Rights Division at Human Rights Watch, said the annual CSW has become an important meeting place for the sharing of ideas, energy and inspiration for women around the globe. “The value of the CSW has shifted from negotiations and outcome documents, to being a space for civil society to engage with member states and with each other. There are fewer and fewer spaces where civil society can come together, and in this one place hordes of women’s rights organisations can come together and talk,” she told IPS. Gerntholtz said the inclusive nature of the CSW — where activists can mingle with ambassadors, where politicians share panels with academics and celebrities — fostered cross-pollination of ideas, and the sharing of concerns between social strata. “I’ve been fascinated to watch people talking about forms of harassment we haven’t talked about before, like cyber harassment, women threatened with sexual violence on social media,” she said. Brautigam echoed the sentiments, saying one of CSW’s most formidable strengths was as a meeting place for sharing of ideas. “I’ve always seen CSW as one of the most, if not the most, dynamic meetings on the UN calendar. It is a prime marketplace of ideas and lessons learnt, for solidarity, and drawing strength for the work for the coming year. People get together, brainstorm and energise each other,” she said. For all the energy, enthusiasm and excitement during the mammoth program, there are also criticisms. The Women’s Rights Caucus labelled the proposed political declaration as “a bland reaffirmation of existing commitments,” saying it “threatens a major step backward” for rights and equality. However, for all the energy, enthusiasm and excitement during the mammoth program, there are also criticisms. Gerntholtz said recent years have seen some member states hoping to roll back progress already carved out, to undo achievements made, and to break pledges for future reform. “There have been concerns for a while over the value of CSW. There have been some attempts in recent years to push back on language in the Beijing platform, particularly on violence against women and reproductive rights,” she said. “In any other circumstances, they wouldn’t be talking to each other, but they caucus to dilute important women’s rights,” she said. The CSW was also criticised from civil society groups. Ahead of the CSW, the Women’s Rights Caucus labelled the proposed political declaration as “a bland reaffirmation of existing commitments,” saying it “threatens a major step backward” for rights and equality. “Governments cannot pick and choose when to respect, protect and fulfil the human rights of women and should not do so in this declaration,” it wrote in a statement. “We are all aware that there are no shortcuts to realising gender equality, the empowerment of women and the human rights of women and girls. Based on the road we have travelled, we know that there are more challenges ahead of us,” she said in remarks at the closing of CSW 59, where Brazil was elected Chair of the 60th session. Already plans for action are being set out for next year’s session. Brautigam said gender equality through the lens of sustainable development would be the theme, with three major global conferences — the Conference on Financing for Development in Addis Abada, negotiations on the post-2015 development agenda and Sustainable Development Goals, and the Climate Change Conference in Paris — to shape, and be shaped by, the women’s rights movement. “The priority next year is women’s empowerment and the link to sustainable development. Between now and then, many important milestones will be met. We’re trying to ensure gender equality will be at the core of those discussions,” she said. Yoon also stressed how the outcomes of the three major conferences would influence the next CSW. “The priority of sustainable development is very important, because gender equality is missing to some extent in the discussions around climate change and sustainability,” she said. Yoon said CSW 60 would likely have much more substantive, concrete outcomes and action plans than this year’s conference, and hoped 2016 would tackle issues of violence against women. “The CSW will decide its whole multi-year program of work, for the next four years. We need to stay focused on violence against women in its broader definition,” she said. With the thousands of delegates, dignitaries, ambassadors, experts, and activists now heading home after an exhausting fortnight, the focus will be on implementing the ideas and actions inspired by the conference. “I hope people can go home with renewed energy, that people can refine their strategies for holding governments accountable, and that they learnt a lot,” Gerntholtz said. Josh Butler is an Australian journalist and writer.